Why have you decided to leave? It really was a difficult decision. I live in London and was working in Cardiff, and it gets to a point whereby your personal life gets swept under the carpet a little bit. There were things that I wasn’t sorting out so I needed to be able to be back in London and refocus. When I told them that I was leaving, I was devastated. I cried my eyes out because I would have very happily stayed on for another year or two. I loved the show and did get on with everyone really well. 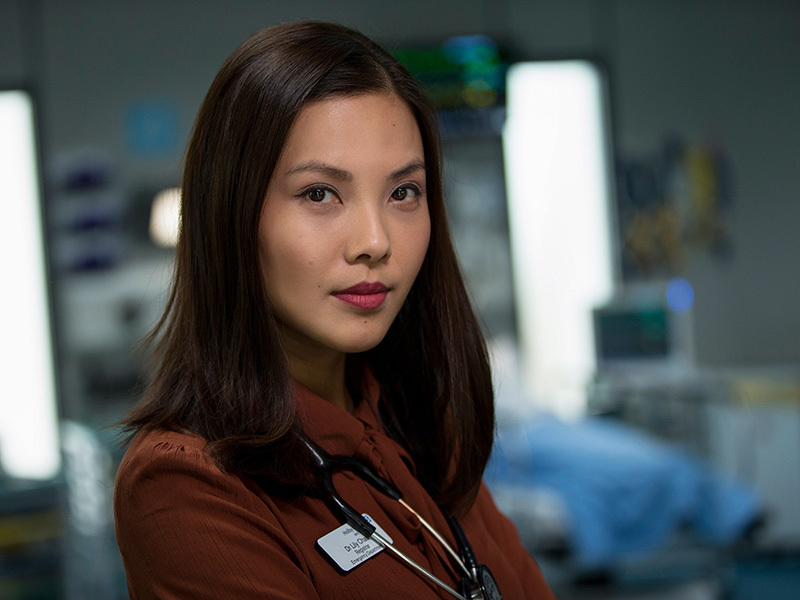 When I was doing the last episode that has just been aired, the director and I talked about how for Lily to leave the hospital she had to break her own heart and leave Iain and that was very much like me when I had that conversation to leave Casualty – I had to break my own heart. Fans have really enjoyed seeing how Lily has changed over the years, are you pleased with her progression? Definitely. I still remember she was so hard when she first arrived. I’m very lucky in the sense that I’ve had storylines where I’ve been given the opportunity to discover different sides of Lily and for me that first moment came when Lily’s father died. That was the first moment where you see she is a vulnerable girl. The one thing I always believe in is to treat people like they’ve always been heartbroken in the past, I always go by that. When I say heartbroken, not just breaking up with a boyfriend or girlfriend, but it means we have all had losses in our life – some smaller, some bigger – and Lily isn’t harsh because she’s always been harsh. Lily is hard because at the beginning, she’s had to do things in her life that have made her build up that defence mechanism to protect herself. So to be able to show that has been lovely. The whole relationship story that was fun. I have always been interested to see who Lily is underneath, why she is the way she is, why she is so defensive, why she feels she has to work so hard and has to put this 5 year plan into motion. It’s seems so in control so I feel at some point in her life she must have lost that control or things were so unstable for her that she felt the only way to gain control was to have this plan. If I do go back in the future, I would love to explore that more. The relationship between Lily and her mum – I loved that. Daphne who played my mum was amazing and we got on really well. So maybe if the opportunity came up, it’s a story to be explored more. Were you happy with your exit storyline? I think it is always difficult to say if you are happy or not because you’re not going to be happy that you’re leaving! But I’m glad that I got to work with Michael. He is such a generous actor and with the whole relationship thing – I haven’t played a lot of romantic storylines in other work I’ve done so to have to kiss someone on screen, I’m like ewwwww! He made everything so easy… He will get so big headed reading this! Fans have really enjoyed the Liliain relationship, how do you think Iain will deal with her departure? I hope he is heartbroken! I think Iain and Lily understood one another subconsciously because they are both afraid. The relationship they both have together – they are afraid to love and to lose one another, and that puts them in a very difficult position because neither one of them could communicate that… if Iain just went ‘Lily, forget about Sam – I want to be with you’ then Lily would have just needed that reassurance from him and similarly Lily just needed to spit things out and go ‘Iain, I’m quite hurt that you want to spend more time with Sam than me, but I love you because I want to spend more time with you’. I think the two of them love from a point of fear. They are afraid to be vulnerable with one another and that is the reason it didn’t work. It could have worked beautifully but because the relationship was surrounded by fear and the inability to be vulnerable and a bit of bravado – you can’t love someone without truth – I think they were both afraid to show their true self. Iain uses Sam as a distraction and she arrived at the perfect time and perfect place, and to be perfectly honest what man doesn’t want to always be desired! What will you miss most about working on the show? The people. I know so many have said it but there wasn’t a day that I didn’t look forward to going into work. It’s very genuine, it’s like a massive loving, and at times slightly dysfunctional family. And when I say the people, I don’t just mean the cast, I also mean the crew, the supporting artists – I have formed such amazing relationships. I’m always curious with what the crew are doing. It’s such a learning environment. So it’s not just the people but I’m also learning every single day from everyone. That in itself is something I will take away with me, that nurturing environment. Who will you hope to keep in touch with now that you have left? I hope to keep in touch with everyone, obviously that’s not always going to be possible. Like I said though I’ve got on so well with everyone that I couldn’t single anyone out. Who would you say is the biggest joker on Set and have there been any funny moments on Set? Tony Marshall. Twerking. No – Tony Marshall trying to twerk!! I think that would be the highlight. Whenever Tony is on Set, he lights up the floor. He’s always positive and energetic, generous and kind to people and it’s a similar ethos I’d like to have. Tony is always quite naughty! My last day on set was hard. When I got into work that morning, I tried to compose myself but as the end of the day got closer and my last scene neared, it was very sad. We managed to finish filming earlier than expected so I just sat in my dressing room afterwards for about an hour, packing up my things slowly, it was my way of saying goodbye. I just needed that space. Did you have a leaving party? I had a wonderful leaving party and to be honest I didn’t want to arrange it myself as I felt that if I organised it myself it became too real that I was leaving! I wanted something really chilled and relaxed, but so many people turned up. Rebecca Ryan came all the way up from Manchester, loads of the SA’s who live in Bristol came and stayed over. I felt really loved. Did you take any keepsakes with you? Costume gave me my Lily badge. I had a couple of costume pieces that they gave me too but apart from that I didn’t take much. I think the badge was the thing that I did want, I know it feels insignificant to some people but for me, I wore that every day. Would you ever consider coming back to the show? Definitely. I love the show, so you never know. But right now as tough as it was I needed to step away for a little bit to put my personal life in order. I’ve been for a lot of auditions and a couple of small jobs, nothing that I’m going to shout about just yet. I have to say I’m open to anything. It would be great to do a play, to stretch those muscles again in a different format. The geek in me would love to do Marvel, like a Marvel villain! But I want to continue to play strong female characters. I’m always drawn to characters that are professionally very strong but emotionally complicated – similarly to Lily, I suppose. She’s tough but there’s a reason why she’s tough: it’s there to mask her vulnerability or weakness within herself. So I’m drawn to characters that are imperfect like that. Finally do you have a message for fans of holby.tv that have supported you during your time on Casualty? Oh my goodness, I’m going to cry! A hundred, a thousand, million times thank you! The Lily journey hasn’t always been easy for me because it’s tough, with long working hours but to feel like you are constantly supported by such an amazing group of fans who are there with us. The reason why Casualty has been going 32 years later is because of the fans. So I feel very blessed. Hopefully those fans will continue to see me go on to do other stuff but I am so humbled by their support, their love and even their hilarious comments on social media. They get so involved. There aren’t enough thank yous in the world to express how I feel. No Comments on "Crystal Yu Interview"